Media: Soft cardboard cover; 302mm x 226mm in portrait format; 38 pages including covers; detailed captions; 4 colour profiles. Advantages: Interesting aircraft not well covered elsewhere; wartime, operational photos and walkaround pictures; bi-lingual captions (in English and Polish); good quality plans included; lists and analysis of available models (Polish text only); seven attractive colour profiles. Ace Publication's new volume on the PZL P.24 comprises 36 pages plus covers, including four pages of full colour. The covers also host attractive colour profiles and scrap-view pictures. The body text is in Polish only, but the captions are bi-lingual (Polish/English). It is also nice to see an English-language summary in this book, as English-language information on this type is not widely available. The best aspect of the book lies in its photos, colour profiles and line drawings. Turkish, Greek, Romanian and Bulgarian PZL P.24s are covered in the photographs and seven very attractive side profiles. Four pages of walkaround photos highlight the subtle structural textures and airframe details of the P.24. 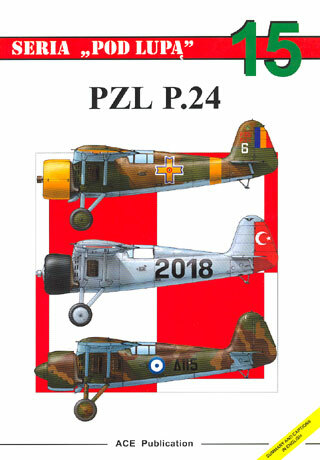 Ace Publication's "PZL P.24" represents a compact and inexpensive introduction to this esoteric Polish export aircraft.